If you’ve been wanting to clean the interior of your car, you aren’t alone. With these simple tips, you’ll have a cleaner car in no time at all! Cleaning your car interior is actually pretty simple and just requires some time and effort. Your car isn’t your portable house, but some people use it that way. Get rid of all the trash and clutter to make it as open as possible for cleaning. If you eat in your car, there are going to be crumbs. Wipe them out and get them out of the car! Vacuum out the seats and all the nooks and crannies as well. It’s amazing at just how much dust can be settled on a surface! The good news? This part won’t take very long. Use a cleaner that you know and trust and make those surfaces shiny clean. Don’t forget to wipe down the parts on the inside of your doors as well! Fingerprints are everywhere! Clean the inside of your windshield and all the other interior windows as well. You’ll be amazed at how much grime was actually hiding in plain sight. Pull out all the floormats and get rid of the grime. Really get between the seats and underneath them, and get rid of anything in your car that isn’t supposed to be there. Make certain that you don’t forget to vacuum the floor mats as well and shake them off before putting them back inside your car. 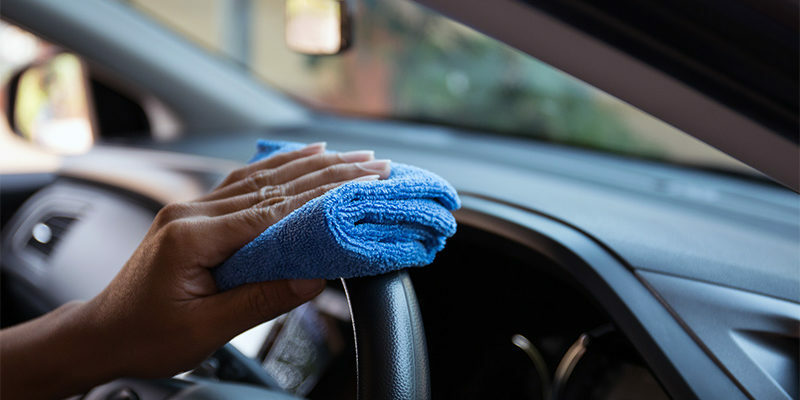 Cleaning the interior of your car isn’t hard, but it’s something that needs to be done! It’s always a good idea to try to deep clean your car at least once a month to keep it clean and as functional as possible. The more that you clean your car, the cleaner it will stay!